Vermont State Parks Offer New Holiday Gift Packages | The Kids Beat | Kids VT - small people, big ideas! Searching for a perfect holiday present? How about the great outdoors? Vermont State Parks is selling park passes, gift certificates, hoodies, mugs and more. Shoppers can select individual items or choose one of three gift packages. Each includes park admittance and a selection of goodies. The Day Tripper sells for $59 and contains a punch card good for 10 park day trips, a pen and notebook set, and a Vermont State Parks travel mug. The Weekend Getaway, $89, includes two nights of camping, a coupon for an armload of firewood, two water bottles and a mini flashlight. And the $139 Full Season of Family Fun provides a one-season vehicle pass good for entry into all of Vermont's 55 parks, two coupons for a one-hour boat rental, an insulated backpack, a deck of cards and a frisbee. The latter, says State Parks sales and service manager Rochelle Skinner, is like giving "a whole summer of things to do." Packages ship for free and arrive wrapped — in recycled paper, of course. Proceeds benefit the parks. And recipients get more than a walk in the woods, the State Parks press release says. Studies show that spending time outdoors reduces stress and increases feelings of well-being. 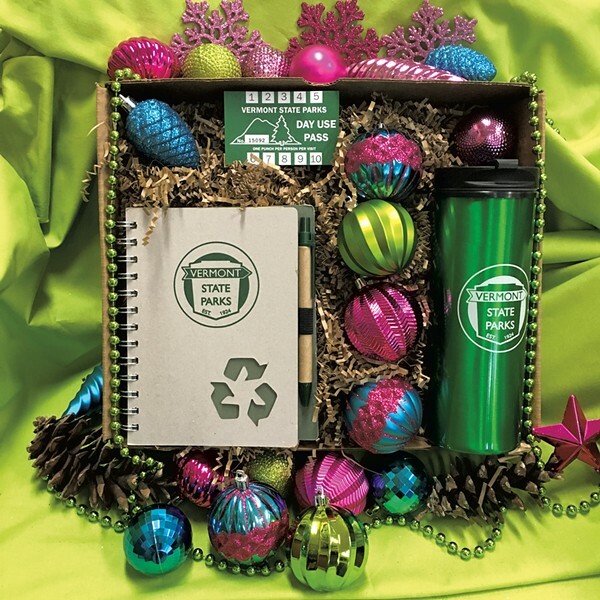 Order Vermont State Parks gifts online at vtstateparks.com.